Earlier in the week I posted my mom’s recipe for nem nuong (grilled pork patties) and presented it as nem nuong sliders and mentioned in passing how versatile this meat dish really is. 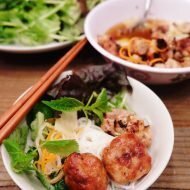 I don’t think I paid nem nuong enough respect and justice as many readers may not be familiar with some of the ways nem nuong is enjoyed in Vietnamese cuisine so i’m posting on one of my favorite ways to enjoy nem nuong, called bun nem nuong (vermicelli with grilled pork patties). Stay tuned for other ways to enjoy this. I don’t think I could have made it through schooling without this. I always had some frozen and ready to grill on the trusty George Foreman grill when I was too lazy to cook or had a lot of studying to do. So this was my quick, go to recipe for a quick meal. The beauty of this dish is it’s flexibility. Use as much and as many fresh herbs as you like. If you have egg rolls, fry them up and put them in too. The light vermicelli and savory nem nuong goes well with just about any fresh herbs or vegetables, making this one of my favorite spring/summertime dish. Using food processor, process garlic until fine puree. 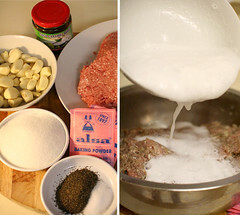 Combine pork, garlic, salt, pepper and sugar in mixing bowl and mix well. In separate bowl, combine baking powder and water and stir. Mixture will fluff and foam. Add drop of food coloring or caramel syrup (this adds a very nice color to the pork when grilled). Fold the baking powder into mixture and allow meat to chill for about 30 min to 1 hr or longer. The baking powder adds more bouncier texture. Now you’re ready to form the patties. Keep meat mixture in the fridge for a few hours to let it set and easier to handle when forming patties, balls or what I prefer, mini sausages. I find that it’s easier to roll in rice paper this way. Keep a bowl of water handy and your hands wet for easy handling. I use an indoor grill (such as George Foreman) as it’s quick, easy to clean, and makes great grill marks. Grill about 4-5 min per side. Place vermicelli in boiling water for about 6-8 min, stirring regularly so it won’t stick to the bottom of the pot. To check for doneness, take a strand and taste. Should be still slightly firm but easily breaks apart. Drain and flush with cold water to stop cooking process. Combine in bowl with nem nuong, lots fresh herbs, pickled carrots and daikon, fried shallots, crushed roasted peanuts and dress with fish sauce vinaigrette. So easy to put together and so so delicious!! Thanks for posting this! I’ve been looking for a recipe to try to make this at home! How interesting. Even though I’m Asian (Filipino), I don’t know that much about Vietnamese cuisine. These sounds delicious! Chocolate Shavings–Please let us know how it turns out for you and thank you for stopping by. Your blog is fantastic!! 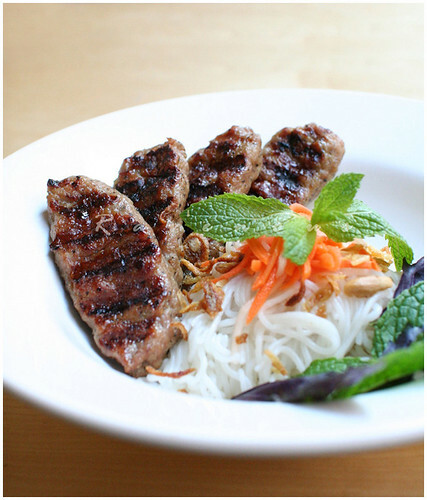 Ninette– We’re happy to share as much as we know about Vietnamese cuisine..Thanks for reading! what is caramel syrup from the asian store? oyster sauce? is the alsa baking powder you use same as any other baking powder? caramel syrup is not oyster sauce. it's a coloring agent…just caramelized sugar. You can even make your own..slowly heat up about 4 tbs of sugar in a nonstick sauce pan and stir until it becomes dark brown. I believe the Alsa baking powder is no different, but it's the one found in Asian markets and what my mom use. Feel free to email us if you have any other questions and let us know how it goes! Really good flavour, but the 2 tbsp of salt coupled with the baking pwd was just too salty for us. I guess it is one way to keep from eating too much meat as it was a good condiment with everything else. my life cycles: thank you for pointing this out to us. 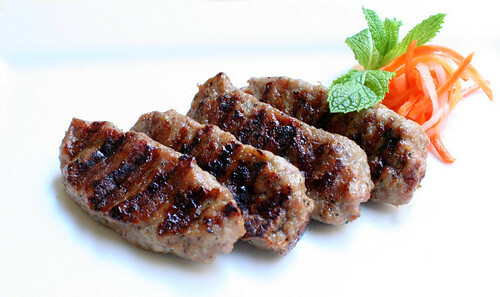 Nem nuong should be on the sweeter side, and we made a mistake and it should be less salt. We've adjusted to account for this. The baking powder makes for a "bouncier" texture and shouldn't make it more salty. Baking powder is available as single-acting baking powder and as double-acting baking powder. Alsa baking powder is single-acting baking powder. Batters made with it need to be baked immediately as it creates gas quickly when moistened. Double-acting baking powders, the most common type of baking powder in US supermarkets, provides leavening in the batter during mixing and continues to provide gas during baking. Has anyone made this dish with double-acting baking powder? Anon: Thanks for sharing this tip on baking powder. We've only used Alsa, but should try other brands to experiment. The Alsa creates the gas bubbles quickly as you mentioned and we fold it into the mixture. It seems to "dissolve" just as quickly as well, but the more we let it rest, the more bounce and springier texture it becomes. I made this and it was so, so amazing! Thank you for sharing the recipe! looks good. if i were to use my oven broiler how many mins per side? 2-3 mins? And do i place them on the top shelf? Broiler temps can be really high temps so i don't want me meat to burn. Also there is a technique the chinese use to make fish/pork paste (like in yong tau foo) i saw which involves pounding the pork/fish with some fish sauce until it becomes sticky, add the seasoning and then shape them into little balls and throwing them back into the bowl to remove the air. This makes them springier, bouncier and more crunchy. Does the baking powder does that instead? Cos the process of throwing, pounding is more tedious. Thanks if u can reply asap…can't wait to make these. @lillian: Yes! you can bake these. Often when serving a crowd, we pre bake it at 400 for about 8 minutes and it will rise nicely, then finish it off on a table top grill for the nice char and have guests enjoy part of the cooking. but if you want to cook it all in the oven, bake, then finish the last few minutes on broil for the char and watch it carefully! Yes, the baking powder will case it to rise and be puffy,bouncy when cooked. I did this recipe and it was delicious, however my meat came out light brown looking and not dark like yours…I probably needed to add the carmalzed sugar to give it color. IT was delicious though! Thank you so much for sharing this amazing (and simple) recipe. We had it with the noodles and all the fixings the first night, then as sliders the next. Yum! These tasty morsels will definitely become a staple in my culinary repertoire. 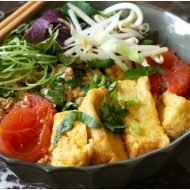 After my husband and I moved away from Vancouver, it was Vietnamese food that we really missed, so finding your blog was a real treasure. Thanks! @jane: so glad you enjoyed, hope you cook more Vietnamese! Hi there! I have a question about the baking powder. I purchased the Alsa brand but noticed it had wheat flour in it. I have celiac and can’t have wheat. Can I use regular and add A pinch of rice flour instead? Has anyone had luck with this? I (white boy) made a 10 lb batch for 20 of my wife’s (vietnamese) family. It was a hit! I cut the garlic in 1/2 and added about 1/2 cup of the frozen shredded lemongrass (my addition) and 4 tsp of toasted rice powder (at the suggestion of di phuong). Next up in August I am going to make your bun bo hue! I believe Alsa is single acting baking powder. Have you ever tried regular double acting baking powder? I wonder if that would make any difference… Btw, for those who can’t find Alsa, you can mix equal parts of cream of tartar and baking powder. I am having a potluck at work. Can the nem nuong be made ahead of time and then rolled into the springroll the next morning / and be served cold? Your recipe inspired me to use frozen nem nuong tonight to make a version of this dish that turned out beautifully. 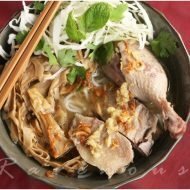 We are lucky to have good quality Vietnamese suppliers to make a tasty meal even easier. What really made it special was your nuoc mam cham, which I did make myself : -). Thanks for a wonderful blog. I love this recipe. I enjoy cooking during my free time and searched for this recipe after I had this type of summer rolls in Socal. I also tried substituting salt with fish sauce and it came out really good! I made this but used regular Arm & Hammer Baking baking soda, which totally ruined the meat. I had to throw out all 2 lbs of natural pork and organic chicken I purchased from an expensive co-op in Seattle. I was totally bummed to say the least. I wish in the directions you would state that other brands of soda are not recommend. Since it states it was a favourite, I didn’t think it meant I could use other brands. so sorry to hear that…baking powder and soda are two different things. some people have used different brands of baking powder with success. in seattle you can get the alsa brand in any of the Viet markets in chinatown or in the rainier valley. Corrections. * I didn’t think it meant I *couldn’t* use other brands. Oh my goodness! I can’t believe I never caught on that it was baking powder. I totally thought it was weird to use that much soda but I was willing to give it a try. I am so mad at myself. Reminds me of the first time I baked 30 years ago when I made this classic mistake. Thanks so much for clarifying!